Hereford beef from Rock Cedar Ranch, Decorah – the main ingredient for the chili. Dried ancho chiles are the kings of the chili world: noble, rich and powerful. Ancho chiles are dried poblano chiles. Their transluscent dried flesh has a cranberry hue and deep fruity aroma. The dark shiny skin reflects and refracts the light. 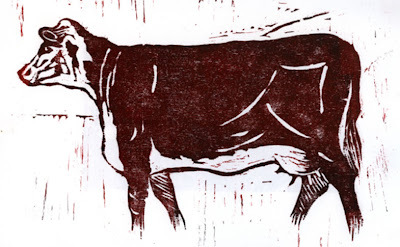 These woodcuts are from the forthcoming book, Chili: a recipe, to be published by Solmentes Press this Fall. Roasted with garlic and blended with spices they make an excellent basis for a chili fit for kings. The fire-brick hearth was unusually hot and I noticed the 8 x 8 inch oak beam at the mouth of the oven was again smouldering. The pizzas were unremarkable and the base of the crust burnt. After breakfast Tom ran into the kitchen: "the pizza oven has collapsed, its burning!" He was right . 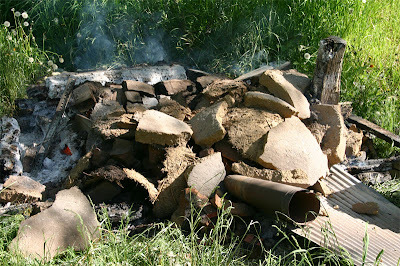 . . my pride and joy was reduced to a heap of burning oak beams among which lay the hearth of recycled fire bricks, topped by the smashed hard-baked adobe clay dome from which jutted the chimney flanked by the tin roof. Thank goodness we didn't build it near the house. Sad indeed, but the next oven will be bigger, better and closer to the kitchen and this time I won't build the plinth from wood! (see Recycling the East-side school}. This sheet of paper, "Spring Medley", made from old nettle, milkweed, hemp, hollyhock and fresh mulberry and iris fibers with floral inclusions of violet, geranium and dandelion petals (19 x 23 ins) was offered at the ArtHaus Auction fundraiser in Decorah on May 4. It was bought for $70.